Halite, commonly known as rock salt, is a type of salt, the mineral form of sodium chloride (NaCl). 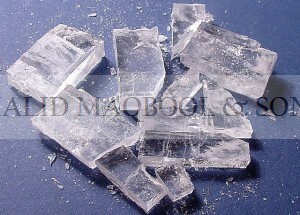 Halite forms isometric crystals. The mineral is typically colorless or white, but may also be light blue, dark blue, purple, pink, red, orange, yellow or gray depending on the amount and type of impurities. It commonly occurs with other evaporite deposit minerals such as several of the sulfates, halides, and borates.